Do you believe there is a Heaven or a Hell? Maybe you do or maybe you don’t but to the Thai people who are predominantly Buddhists, Heaven is as real as karmic retributions and the struggle between good and evil. 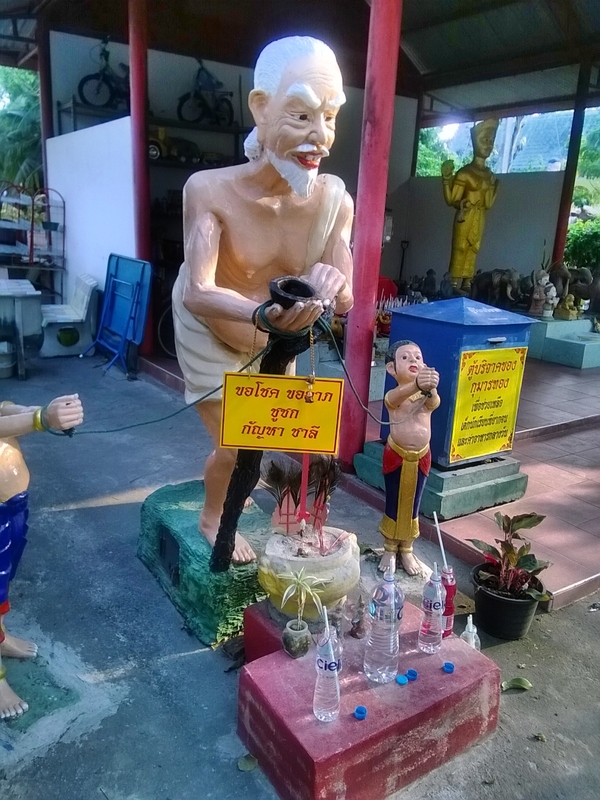 It is their way of life and the Buddhist system of belief here in Buddhist Thailand. 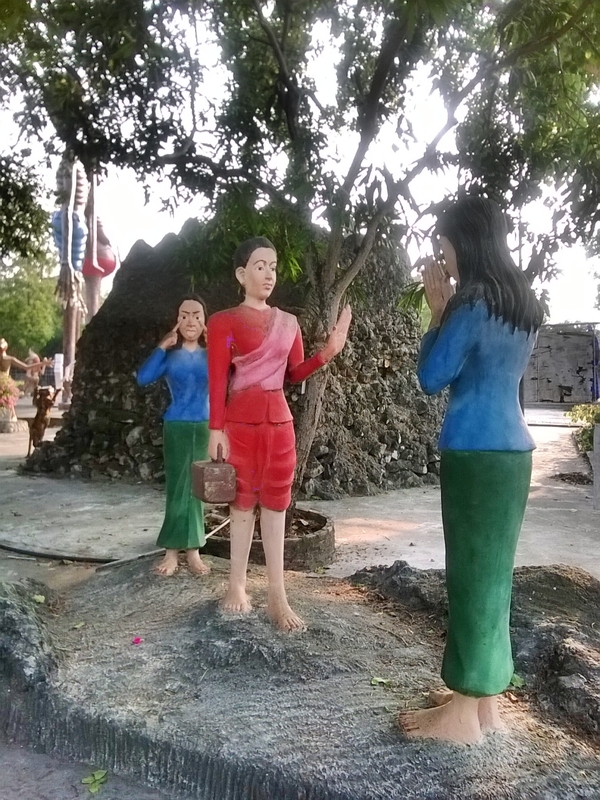 Parents will teach their children or rather scare them into being good through very graphic re-renditions of a Heaven and Hell scenario and ghostly stories are a norm here in Thailand. The belief of the supernatural is also a way of life and the dead coming back from their restless death is nothing new, neither is it anything surprising. Therefore, the many Buddhist monasteries literally Hell-bent on scaring the beejeebies out of children and people on the realities of Heaven and Hell are numerous in Thailand. One such monetary is located in the province of Chonburi, in the town of Baan Saen which is a seaside town located a two hour drive from the city of Bangkok. The usual activities in this laid back township is focused more on beach and seaside activities, their seafood markets, the famous bamboo steamed glutinous rice and as a weekend family destination. However, nestled in a little corner of all this is a garden monastery run by a group of monks who are actually focused on training young monks to be, in the district of Baan Saen. 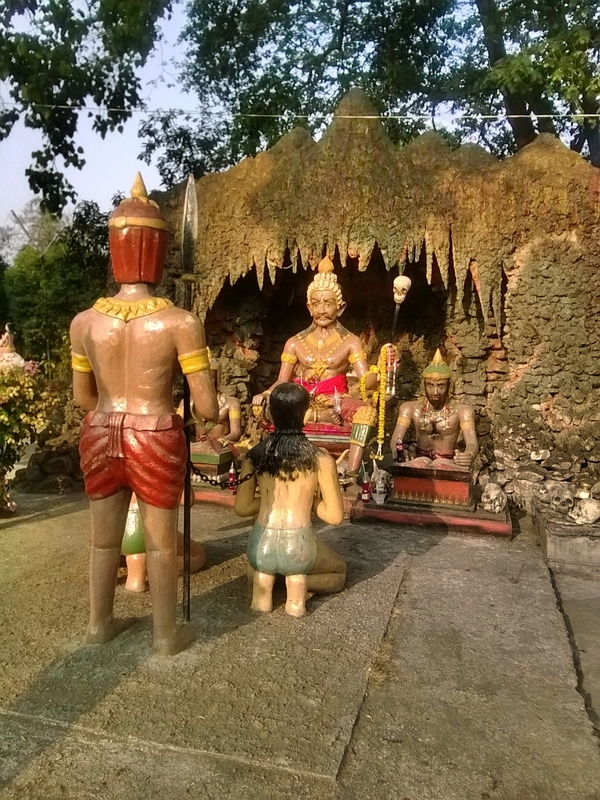 It is actually the Baan Saen Monastery but better known by the name Baan Saen Hell Garden. This monastery teaches young monks the principals of karma, retribution and moral values. It is a fairly run down monastery as they mostly depend on donations for the upkeep of the place but no less interesting with the displays within the temple grounds. This rather obscure monastery though not in the best up kept condition, still draws a horde of tourists who are mostly locals on the weekends. Families come here with their children to spend the day among the statues and have picnics or couples come here for evening walks and time out together. The latter on one hand is rather whimsical, considering the exhibits they have on display and the supposedly moral implications taught within the grounds! The main entrance to the monastery has a large gateway and a little sign on the side that says appropriately “Welcome to Hell”. 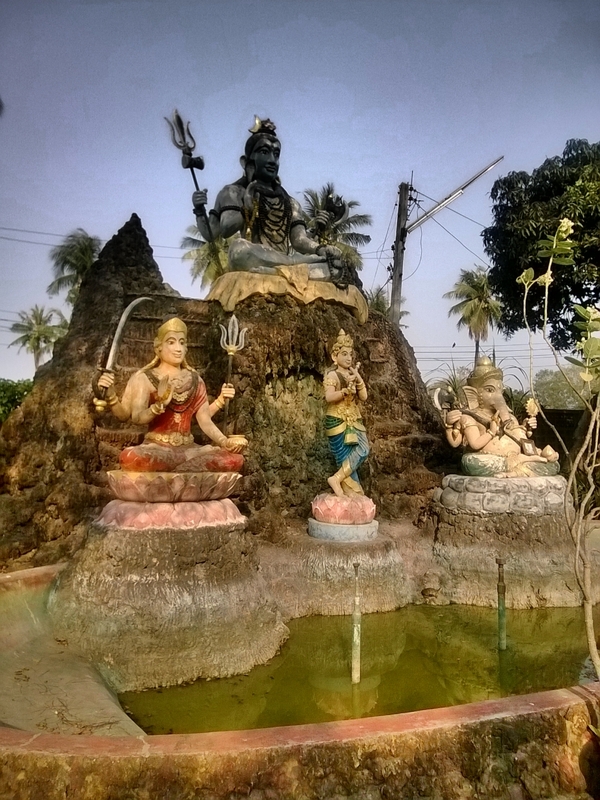 Located on both sides of the entrance gateway are more than life-sized statues of Heavenly deities. The deities have a touch of Chinese Buddhism characters and some of the other Heavenly deities on the inside depict such characters as the Chinese Goddess of Mercy, Kuan Yin on her lotus pedestal as well as the Chinese God of War, Kuan Tai Kung. These Chinese God like statues are the mild side of the display and there are about two dozen such statues on the left side of the walkway into the monastery. 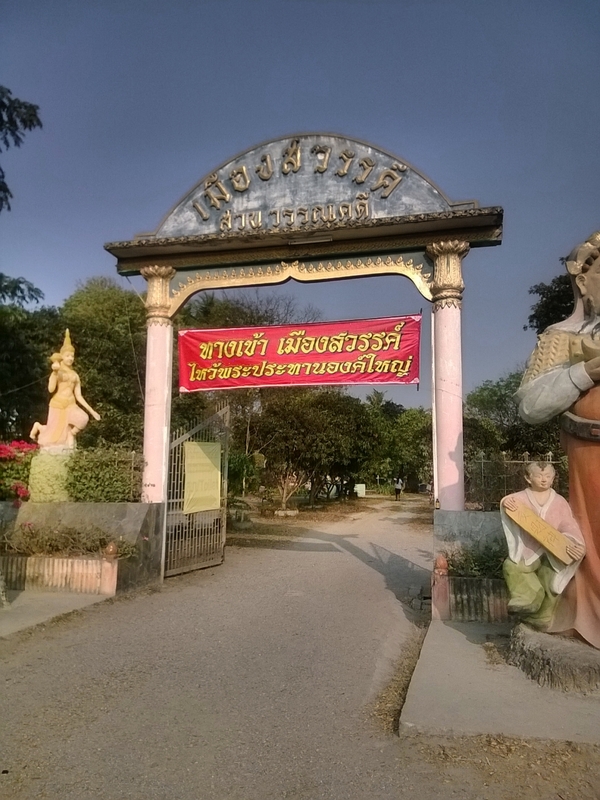 Under each statue is an inscription describing the character in Thai and in the English language. The statues all need a new coat of paint as some have been vandalized while others have their paint chipped off due to wear and tear over the years. The garden is fairly simple, not much landscaping has been done and the end of the walkway brings you to the monastery shrine. You can make offerings and prayers at this shrine or you can buy some goodies to feed the fish and tortoises located in a pool behind the shrine. Feeding these animals is a form of charity and merit according to Buddhist belief and there is always good karma when you do that, so for around THB20 it might not be such a bad idea! 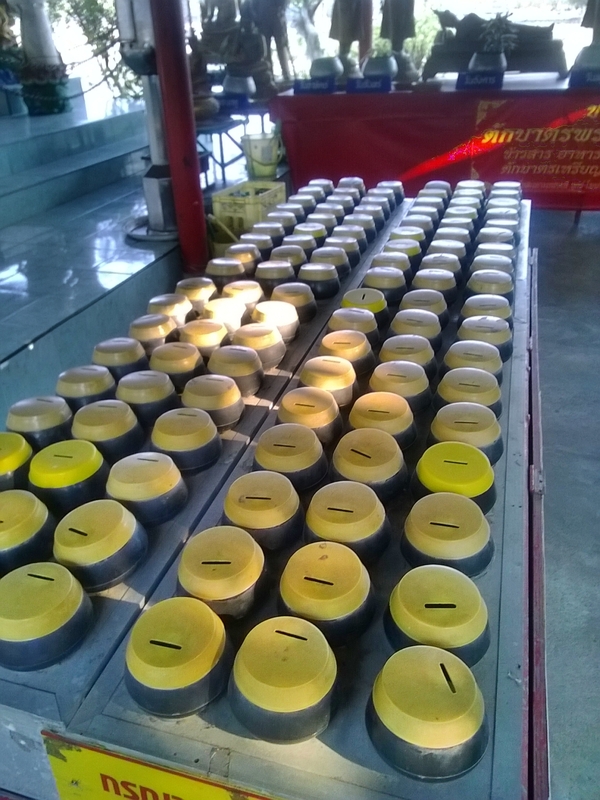 There is also a donation box for generous visitors to donate to the monastery so that they can upkeep the place as they do not collect and entrance fee. If you can afford to be generous here, please do so. As you leave the shrine and monastery area, you would come to another part of the garden where there is another small pool with a few figures in it. This pool depicts the Heavenly and Hellish characters which is the start of the introduction to the Hell section of this garden space. On the left as it is with the earlier entrance way are figures displaying characters and deities from the Underworld and their inscriptions. 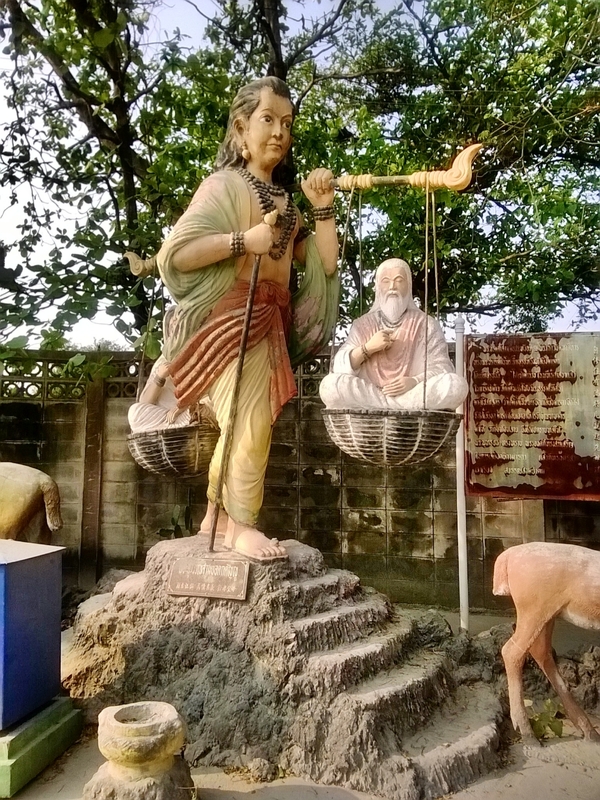 It is funny how these statues seem to be in better condition that the ones from the Heavenly side. On the right side of the long walkway are scenes depicting stories of moral such as do not back stab your friends or co-workers, do not steal and lots more. Behind these rows of morality scenes is the result of what will happen if you do! First scene in this section is an audience for the deceased that will be brought before the God of the Underworld for judgement on their deeds in the life before. Accompanying them are the lesser “collector” demons that are sent to collect the souls of the newly departed. 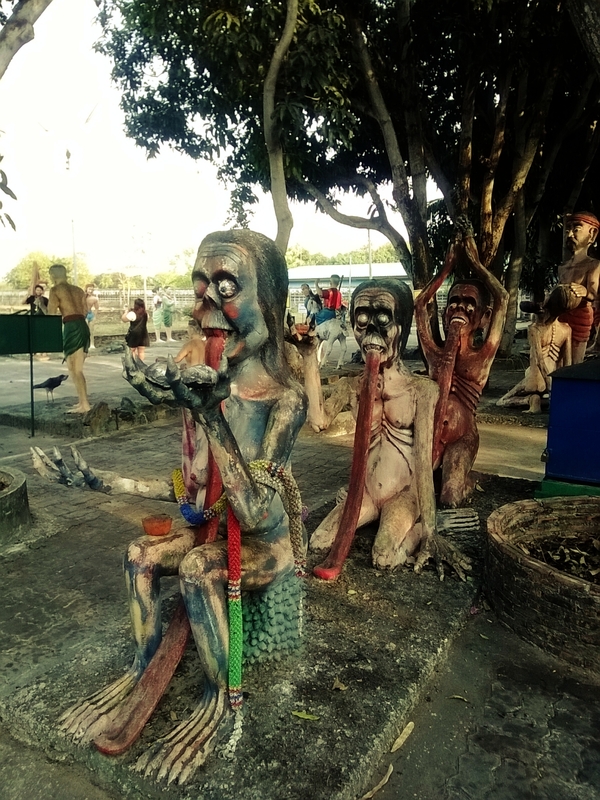 These demons are reputedly to have the bodies of men and the heads of a cow and a horse or called “Ngau tau” and “Ma meen” in Chinese Buddhism. When the deceased are brought for judgement, if their sins outweigh their good deeds then they are sent to Hell to be “purified” and to repent their sins. According to Buddhism, the length of their stay in Hell and the duration of each punishment is dependent on the severity of the action. 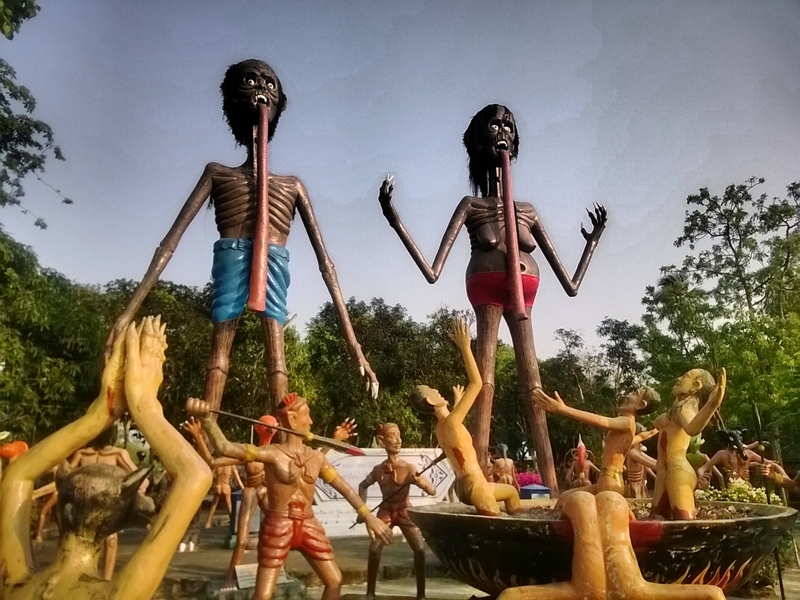 After judgement has been passed, the deceased souls are then brought to the Underworld to begin their time in Hell. Their first introduction would be to Father and Mother Demon, the undertakers of Hell and their many minions. Even in Chinese Buddhism they believe that the Hell spawn are Legion! Their greetings of Father and Mother Demon is a rude awakening to the treatment they have been met out with and the first is a rough manhandling by the keepers of the Underworld to be thrown into a cauldron of boiling oil until their skin blisters and peel off. It is interesting to note that it is believe that these punishments are done over and over again as at the completion of each torture method, the sinner is rejuvenated and made to go through the whole process so as to feel the pain and humiliation for an indefinite period of time. Talk about rewinding and replaying an old record again and again and this is almost perpetual! Further on are scenes of various punishment and torture methods met out to each type of wrong-doing. Some of these scenes are very graphic and gory, not intended for the faint-hearted but a delight for the gore lovers. They are meant to frighten the viewer into not committing these sins so as to avoid such a time in Hell. Weather it has any basis for a change of heart or morality for the viewer is yet to be ascertained but viewer discretion is advised if you want to visit this place. 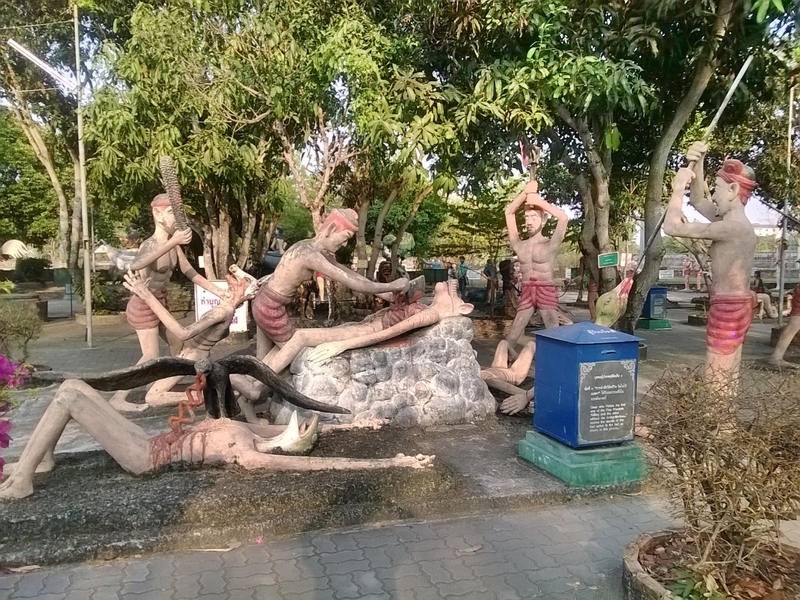 There are examples of terrible torture methods for carnal sins such as abortions where stakes are driven through the private parts into the womb to signify unbearable pains for abortions, tongues ripped out for telling lies, disembowelments and innards eaten by giant crows and naked sinners having to climb a densely Thorne tree among the more graphic torture scenes found here. None of these scenes depict anything pleasant or easy for sinners and a grim reminder of what is waiting for us based on the severity of our offenses. Sinners look the worse for wear and tear at the end of their torture and time in Hell, appearing ghoulish, emaciated and symbolic of all the figures noted in descriptions of horrid ghostly figures in your worse imagination and nightmares. 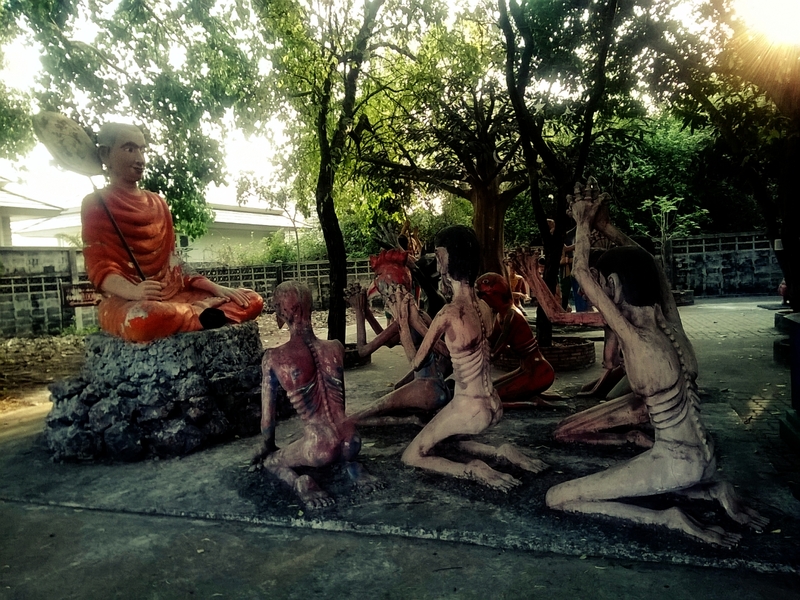 At the end of the torture cycle, sinners are brought before the Enlightened Buddha, who presides over penitent sinners. They are asked if they have learnt from their sins and if they repent. Upon which the next cycle of their life will be allocated to them in the Karmic Wheel of Reincarnation. Depending on how severe they have sinned and the time they have spent in Hell, each sinner will be judged accordingly. If their sins were severe, they would be reincarnated as lesser beings such as an insect or an animal to serve another purpose and cycle in life. If their sins are considered not as grave then they could be reincarnated as humans but probably with a form of disability or similar to relearn their life purposes. 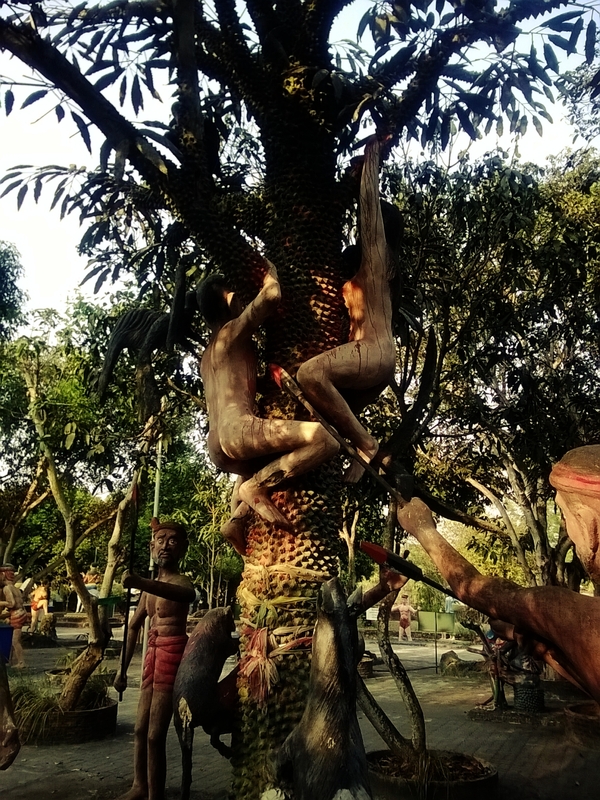 So the next time you are wondering where you would like to visit while in Thailand, especially for something a little peculiar, give the Baan Saen Hell Garden a try. Not only is it an eye opening experience but also one that would be educational on the beliefs of Thai Buddhism.